Aaand we're back! This weekend I took a trip to South Carolina, part of which was spent in Sumter, SC. While there, I decided to visit a store I'm not sure I've entered since high school. The store in question is called Oh! Calcutta, and it's been around for as long as I can remember. First it was in the fabulous Jessamine Mall (now Sumter Mall), then it was next to the Food Lion on Guignard. I think it's had at least one more location before it's current placement, but now it's in the old Curves that shared a parking lot with the now-defunct Sycamore Video. The owner of Oh! Calcutta is a man who will gladly tell you that he is from India. This, I'm guessing, is why the store is named Oh! Calcutta, rather than any reference to the theatrical revue of the same name. However, it does neighbor a lingerie store, so...who knows? If you visit the store, be prepared to answer a lot of personal questions while you shop. The owner, having been robbed several times (he informed me), keeps a close eye on all customers. I assume he thinks all the questions disguise the fact that he is watching all patrons like a hawk. In any case, he is friendly enough, and the merchandise is so good, it's worth a little unnecessary conversation. Now, let's talk about what's actually for sale in the store. 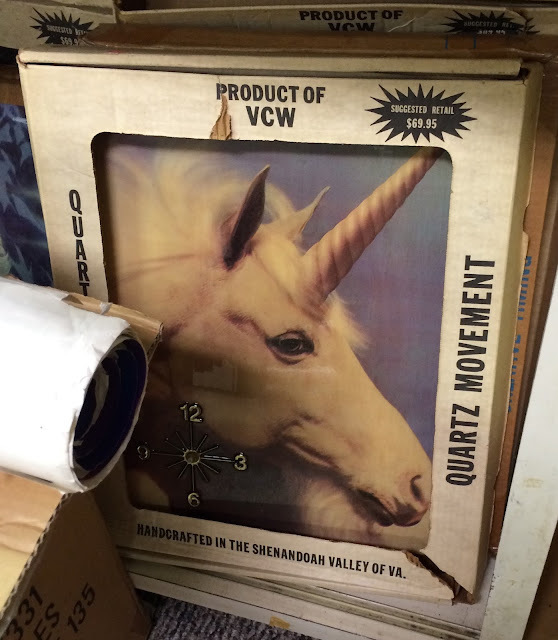 As far as I can tell, some of the merchandise in Oh! Calcutta has been there since its opening. There are racks and racks of tee shirts which are somehow both brand new and vintage. By this, I mean that they've never been worn, but you can tell they're not reproductions. Here, let me show you. 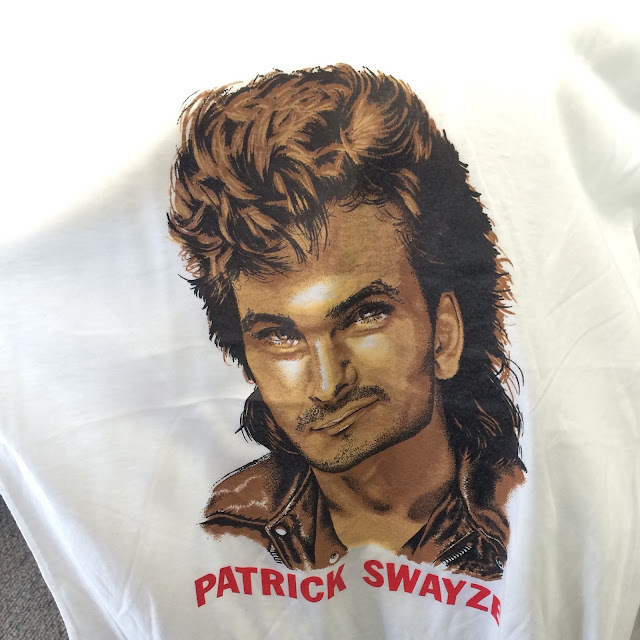 Here is a Patrick Swayze Tee Shirt. At the time of my visit, Oh! Calcutta was in possession of more than one of these tees. On the same rack, there were Boyz II Men, Paula Abdul, New Kids On The Block, and Guns N' Roses tees, just to name a few. All were brand new, but all were original. I could tell by the puffy printing ink on the New Kids On The Block Tees. It was brilliant! The tee shirt racks were also home to some real local gems, like this Jessamine Mall Elvis Illusion tee. I'm not sure what this is about, but perhaps Sumter's Mall used to stage performances? Oh! Calcutta doesn't just have tee shirts in their clothing department. They also have a bunch of jerseys, leggings, baby tees (from the early 2000s), and brand-spanking-new wind suits. Yep, this was just one of the glorious sets. There were several pink and purple options as well as a brilliant Charlotte Hornets number. 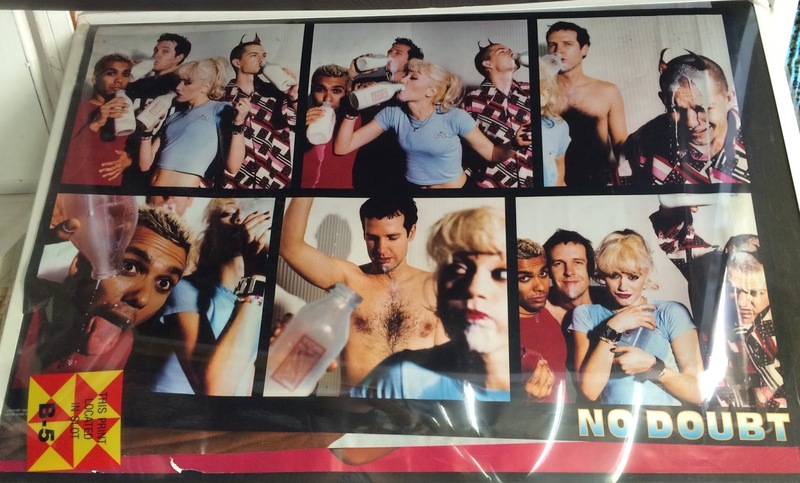 Remember when everyone used to put band posters on their walls? Well, Oh! Calcutta has some of those, too. At this point, they might actually be worth some real money. Maybe it's time to open up that Ebay Seller's account, eh? I mean, look at this! It's basically a priceless artifact of our country's history. Look at that outfit. Apparently there is an MC Hammer Blog, also, guys. There were also lots of oversized buttons. I want to say these were all about 5" across. I don't know where you'd actually put or wear these, but they're kind of amazing. Look at that baby face! But, alas! 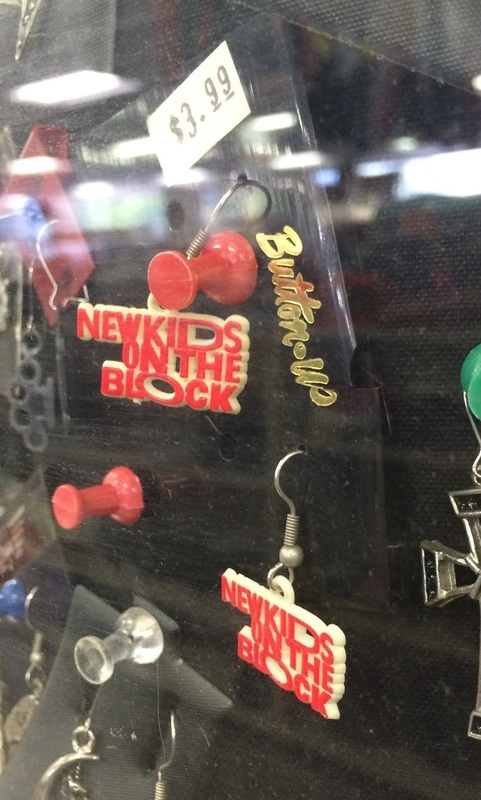 Perhaps you prefer something a little more subtle to show your NKOTB pride. That's where these earrings come in. Similar earrings go for almost $8 on Ebay, but at Oh! Calcutta, you can get them for just $4. And, since we haven't talked about the unicorn at the top yet, there are some really excellent clocks in that store. They're all sort of resin-coated on planks of wood. 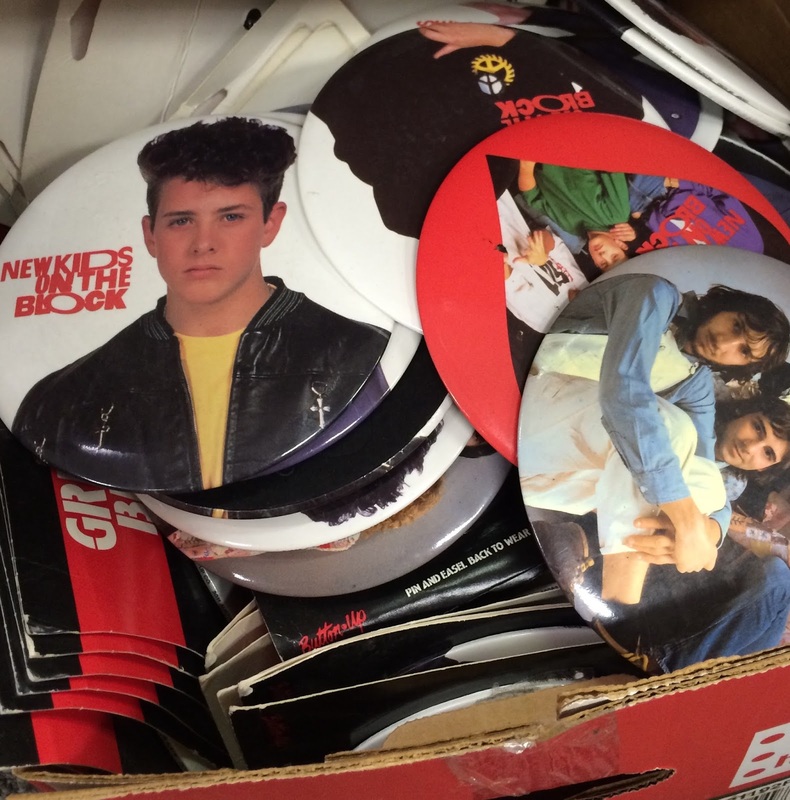 In case you were wondering, there was definitely one with a New Kids On The Block theme. Now, if you live in the Sumter area, I guess we all know where you'll be on your lunch break today. Just be forewarned, though. The shop keeper doesn't really care too much about air conditioning.